Proper Tea Day – Come and Join Us! Proper Tea Day, otherwise known as The National Tea Day Festival takes place at Kensington Roof Gardens in London on the 21st of April. 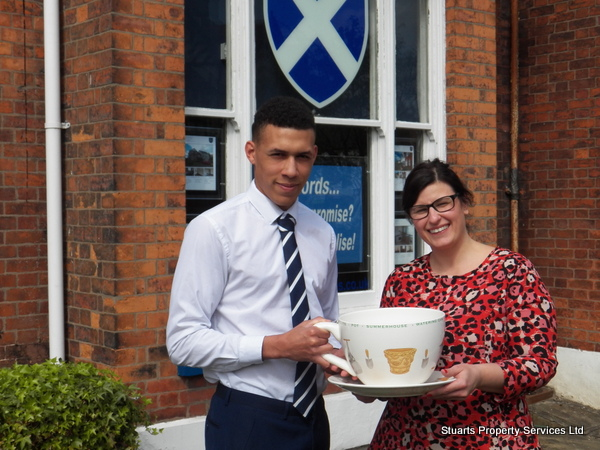 HOWEVER…… We are also having a ProperTEA Day here at Stuarts ProperTEA Services in Cheadle. Come and join us for a cup of tea and discuss our different services anytime on Friday 21st April 2017 between 9am and 5.30pm – ALL WELCOME! Our lovely staff Lewis Hamilton and Vicky Kelly will be on the front reception to welcome you, and Colin, Clare, Amanda and Margaret will be available to chat to as well with your property questions. Stuarts specialise in Lettings and ProperTEA Management. Established since 1908. Useful fact: Drinking tea became popular in Britain during the 17th century. Stuarts Property Services Ltd was Established in 1908 so not far off! We cover all of South Manchester and Central Manchester and maintain 100% focus on letting and properTEA management. Landlords – To provide a comprehensive service to every landlord whether experienced or new to lettings with a friendly but professional service that exceeds expectations and maximises the return from property portfolios large or small. Tenants – To provide tenants with stress-free and efficient moving process with a commitment to maintaining the property throughout their tenancy offering advice and guidance where required. Prospective Tenants – To assist prospective tenants to find a property meeting their requirements and to regularly communicate with them. Our experienced staff offer a wealth of knowledge and excellent customer service care, and with high street presence, we offer an open door policy should you wish to discuss your properTEA requirements. So let’s participate in National ProperTea Day in Style! I can highly recommend Stuarts to landlords and to tenants alike. Their staff are always extremely knowledgeable and helpful… I have used many letting agents and am grateful to have finally discovered such a proficient service. The epitome of professionalism… all you need from a letting agent. I have been with this company for over 7 years. I would highly recommend them to anyone who is after a secure and well looked after rental. Claire, amanda, Margaret and Colin are not only helpful but genuinely lovely people. Anytime I have a request they sort things out for me straight away. I feel safe and trusted in the property I live in and if I would ever have to move, I’d definitely stick with Stuarts to find me a new home. Come and join us for a cup of our finest and have a look at our services and properties on offer.